After years of coordination, planning and fundraising, the Lake Oswego Veterans and First Responders Memorial has officially broken ground. 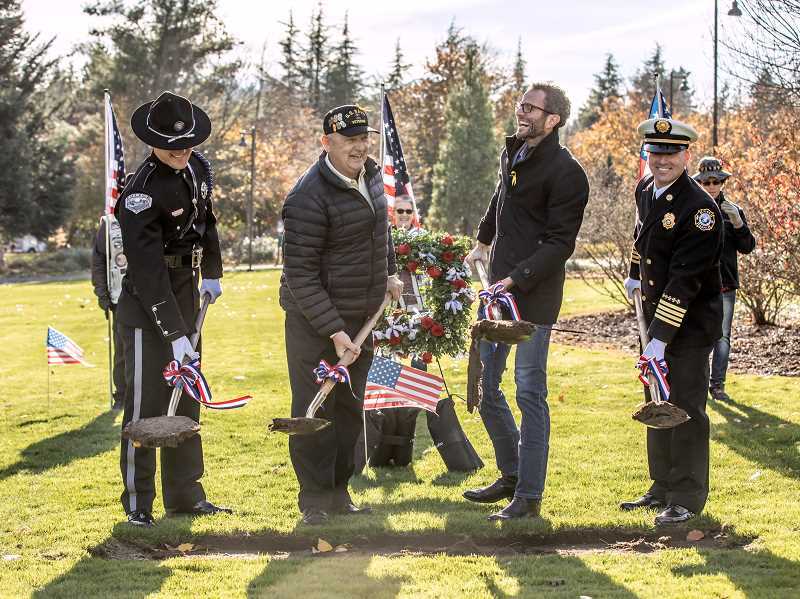 Veterans Memorial President Bob Hill, City Councilor Joe Buck, LOFD Assistant Fire Chief David Morris and LOPD Officer Bryan Sheldon turned the first shovels of dirt Sunday following a reverent Veterans Day ceremony at Foothills Park. When it's completed, the new memorial will pay tribute to police, firefighters and those who have served in the U.S. Armed Forces. The inaugural phase is expected to include a main granite wall, two smaller granite walls for fire and police, paths, granite benches, pavers, smaller honor walls for veteran's names and perimeter landscaping. The group behind the memorial is seeking sponsors for individual bricks and plaques engraved with the names of veterans and first responders, as well as for the various benches that will be placed throughout the memorial site. Details are at www.loveteransmemorial.org. "Thank you all for coming to honor our service members," Hill said on Sunday. "We hope you will be standing in front of a beautiful memorial here very soon." The event was emceed by Navy Capt. 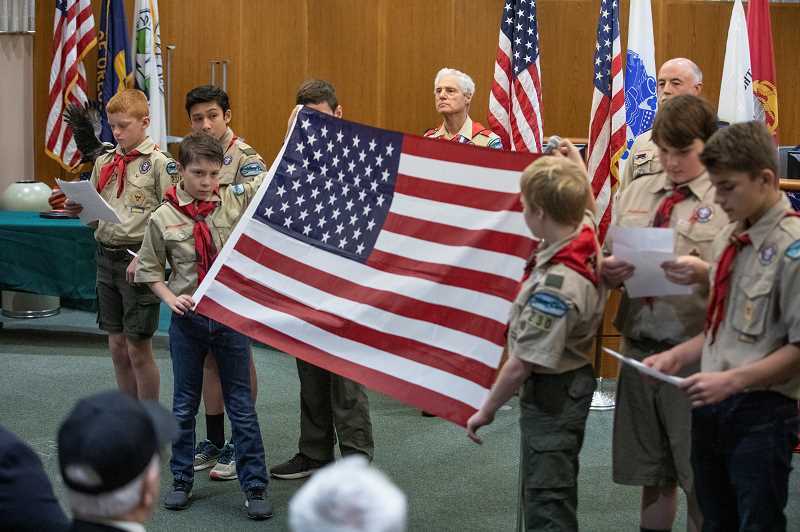 Jonathan Puskas, a Lake Oswego native and graduate of Lakeridge High School, who currently serves as deputy commander of Coastal Riverine Group 1 in Imperial Beach, Calif.
After the colors were presented by the Lake Oswego Police Honor Guard, Oregon Patriot Guard Capt. 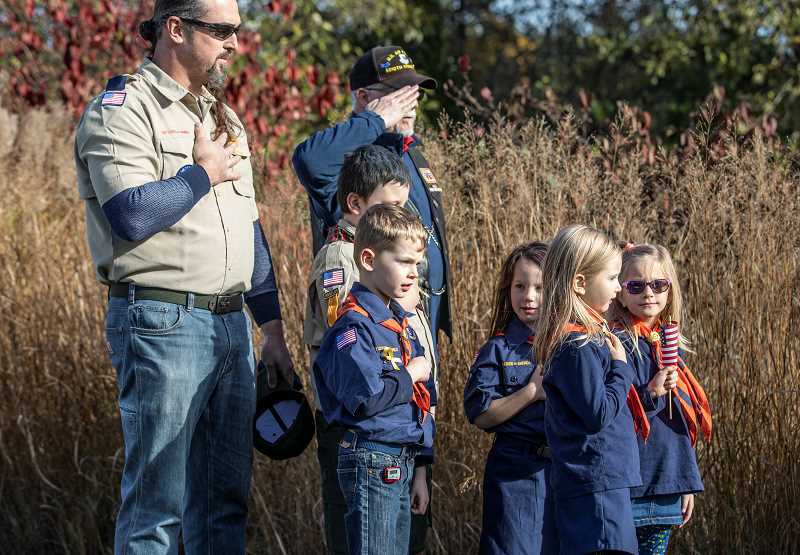 John Hanan and Cub Scout Pack 203 led the crowd in the Pledge of Allegiance. Puskas then introduced Maj. Alex Runyan, who served as the event's keynote speaker. Runyan graduated from the U.S. Naval Academy in 2006 before being commissioned as an officer in the Marines and joining the Marine Light Attack Helicopter Squadron out of Camp Pendleton, Calif. While station in California, he served as a Huey helicopter instructor pilot, conducting multiple tours in support of the wars in Iraq and Afghanistan and peacekeeping missions in Southeast Asia. "When I look back, I feel an immense amount of nostalgia and pride when I think about the journey I walked alongside some of the most incredible people I will ever know," Runyan said. "I'm blown away by the integrity, grit and resolve of these folks I witnessed during my 10 years in Marine aviation. My desire now is to always spend this special day honoring those sisters and brothers who have served and are currently serving this great country." Originally from Ohio, Runyan and wife Brit moved to Portland in 2016 after he lef active duty. He began working for the business and technology consulting firm Slalom, where he continues to serve others by helping businesses grow, solve problems and build for the future. "When I left active duty, I knew I needed support, for people to believe in me and who I am, not just for my service," Runyan said. "I wanted to feel like part of a genuine community. We can all do our part to share thanks by building our communities, state and country through local government, our churches, nonprofits, the youth in our communities and our service members as they transition from active duty to civilian life. Find a way to say thanks that is authentic to you." 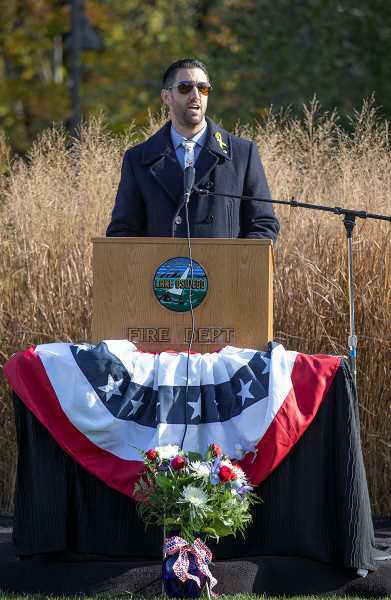 Runyan spoke not only of the sacrifice made by those who choose to serve, but also of the sacrifice made by family and loved ones who are left at home. He talked about how his wife became a pillar of his family when his brother, Army 1st Lt. Michael Runyan, was killed by a roadside bomb during a 2010 deployment in Iraq just months before Runyan left for his second tour in Afghanistan. "My wife didn't choose that life. She chose me, and she sacrificed so much during that time in choosing to support me and my family, our family," Runyan said. "She was the rock for my mother while I was gone and supported my family through the loss of my brother. We all have stories like that for those of us that have served and left our families to go and do the deed. I encourage us all that when we acknowledge the service and sacrifice of our veterans, that we also notice and acknowledge the sacrifice of the loved ones who support us." 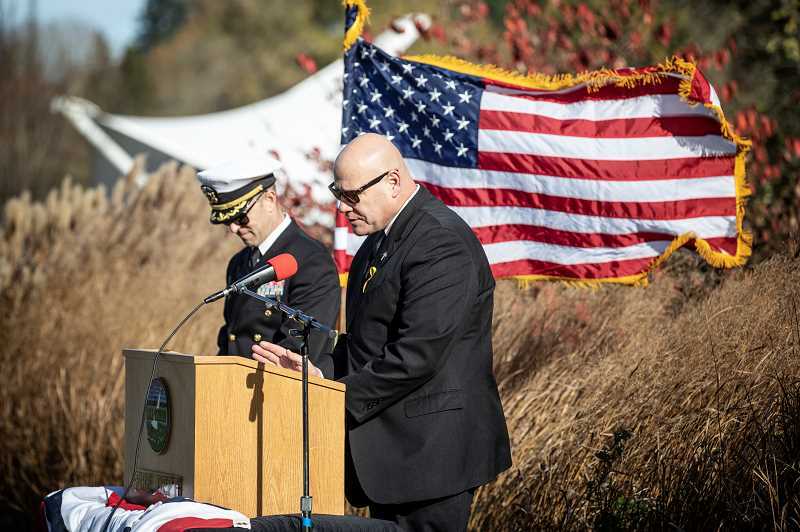 The event at Foothills Park unfolded just as another Veterans Day gathering was wrapping up at Lake Oswego City Hall. It featured veterans and active duty military, including representatives of the Oregon Air National Guard. Attendees at the City Hall event were able to interact with and learn about the sacrifice that service members make when they choose to serve their country. 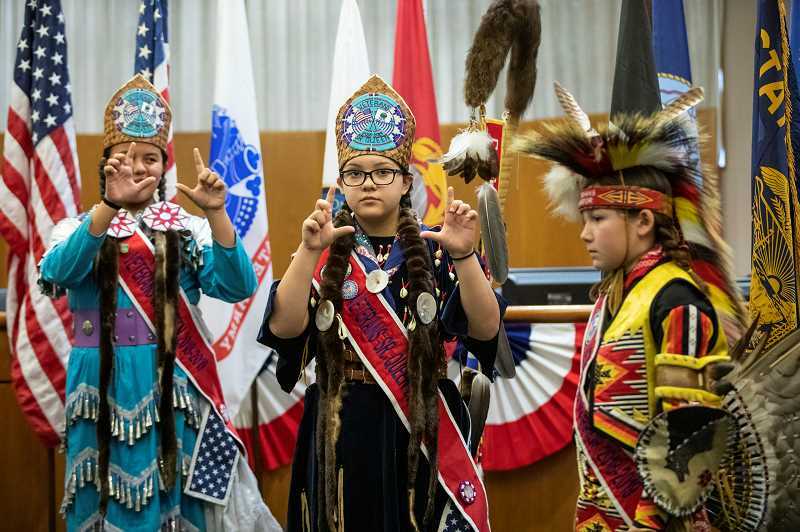 Also in attendance were members of the Portland Police Highland Guard, Lake Oswego Boy Scout Troop 230 and members of the Confederated Tribes of Grand Ronde, who performed a brief ceremony.